The validity period of retaking the examination is limited to one year from the first Examination date of the candidate; Candidates who fail to pass the examination within the one-year period is required to retake the BEAM Plus Interiors (BI) Training and to pay for the full payment of Training and Examination fee. The validity period of retaking the examination is limited to one year from the first Examination date of the candidate; Candidates who fail to pass the examination within the one-year period is required to retake the BEAM Plus Neighbourhood (ND) Training and to pay for the full payment of Training and Examination fee. The validity period of retaking the examination is limited to one year from the first Examination date of the candidate; Candidates who fail to pass the examination within the one-year period is required to retake the Existing Buildings (EB)Training and to pay for the full payment of Training and Examination fee. The validity period of retaking the examination is limited to one year from the first Examination date of the candidate; Candidates who fail to pass the examination within the one-year period is required to retake the BEAM Affiliate Training and to pay for the full payment of Training and Examination fee. The training includes the general concepts of BEAM Plus New Buildings, BEAM Plus Existing Buildings, BEAM Plus Interiors and BEAM Plus Neighbourhood rating tools. 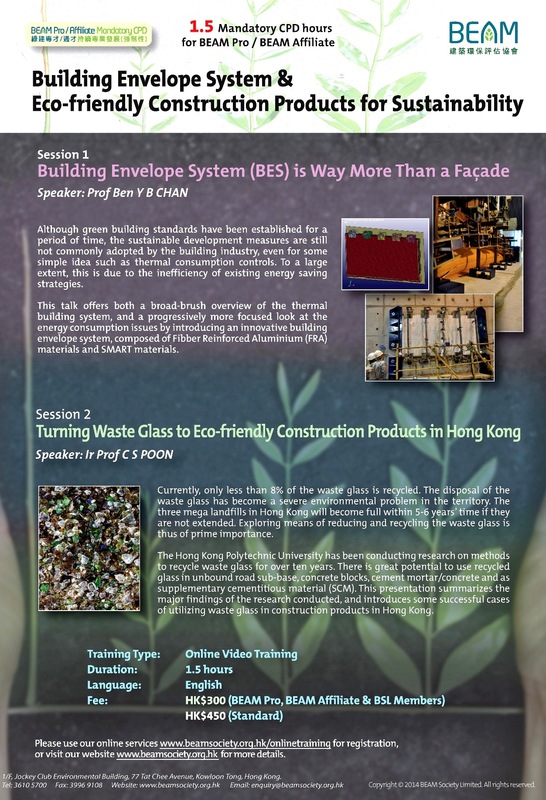 Trainers are invited from the Green Building Faculty, which consists of a group of experts and professionals that supports the initiatives of green building and sustainable environment in Hong Kong. 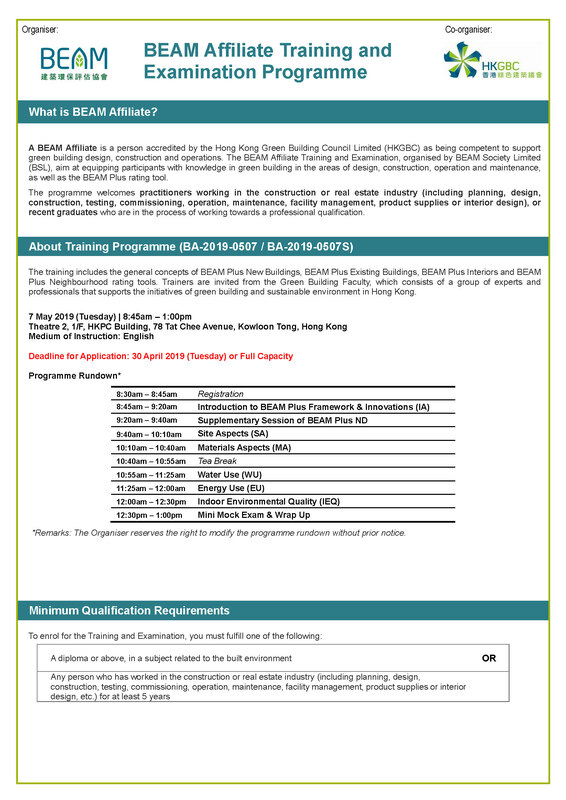 The validity period of retaking the examination is limited to one year from the first Examination date of the candidate; Candidates who fail to pass the examination within the one-year period is required to retake the BEAM Plus New Buildings (NB) Training and to pay for the full payment of Training and Examination fee. 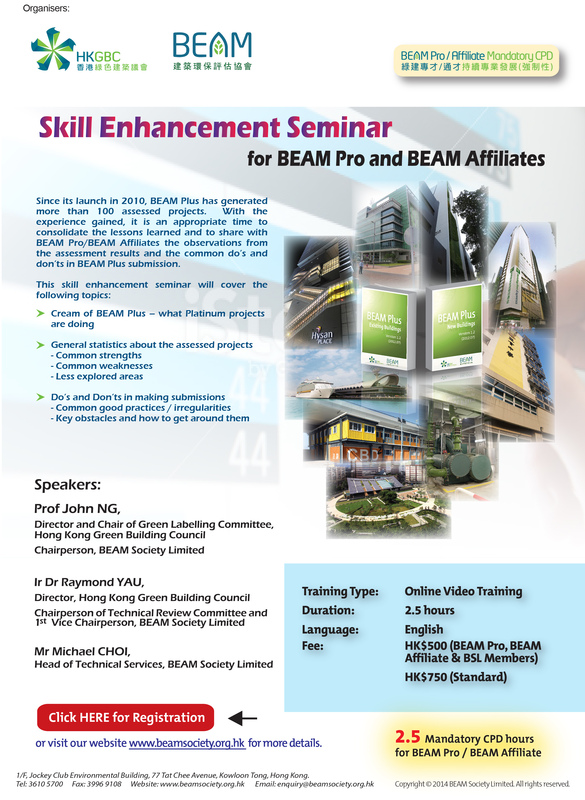 This course provides in-depth knowledge of BEAM Plus assessment tools with practitioners who aim to earn the credential to demonstrate their proficiency in certain field of expertise I. Framework of BEAM Plus BI; II. In-depth knowledge i.e. grading, credits and feature of BEAM Plus assessment tool; III. Innovative and sustainable design skill; IV. BEAM Plus project submission skill. Expert Panel Chair of Material Aspects, BEAM Society Limited. IV. BEAM Plus project submission skill. Panel Chair of Site Aspects, BEAM Society Ltd.
Computer simulation is a significant tool for design, operation and maintenance of green building, particularly in energy performance and thermal comfort analyses for building occupants. The reliability of simulation results depends on the proper utilisation of software, translation of building information into simulation input and interpretation and understanding of output from software. This course will provide the participants with the introduction and basic knowledge of the application of computer simulation in built environment. 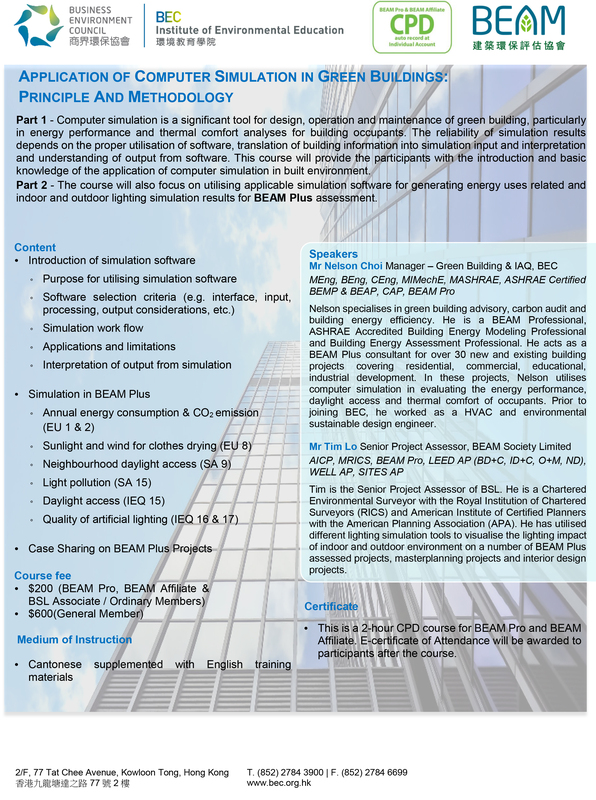 The course will also focus on utilising applicable simulation software for generating energy uses related and indoor and outdoor lighting simulation results for BEAM Plus assessment. 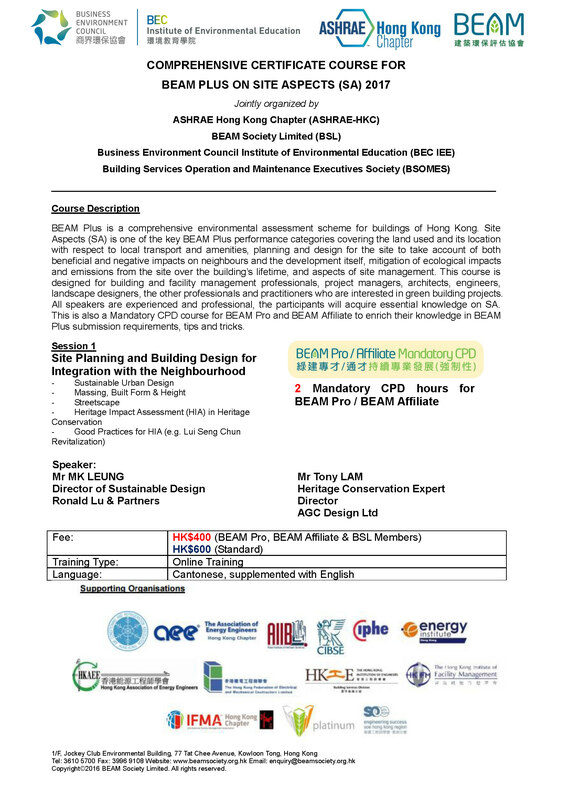 The speaker will share his observations from the past BEAM Plus Existing Buildings (EB) v2.0 Comprehensive Scheme submissions with BEAM practitioners. Good examples and methodologies will be covered. 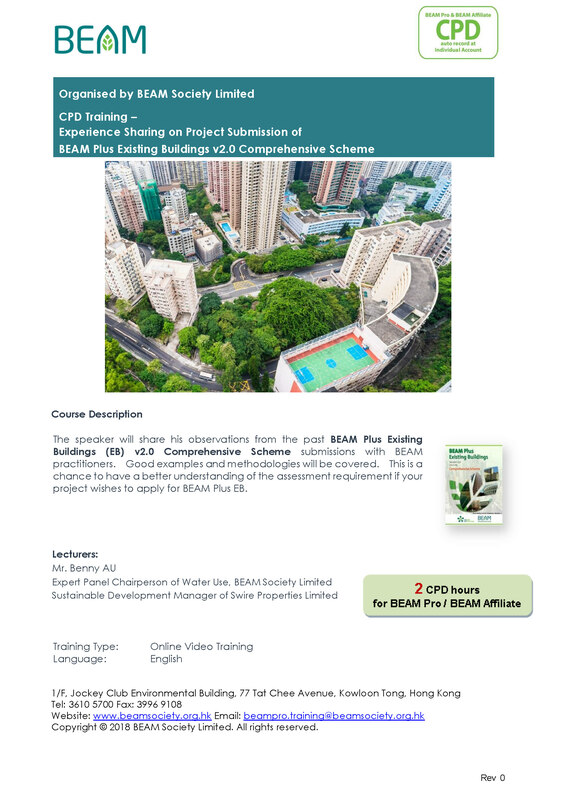 This is a chance to have a better understanding of the assessment requirement if your project wishes to apply for BEAM Plus EB. With growing economy, dense urban development and increasing population, Hong Kong is facing serious noise problems. Acoustics is also one of the important aspects in green building assessment and is often cited as one of the challenges of ventilation strategies. With a better understanding of acoustics issues, building practitioners can know how to assess, control and manage. 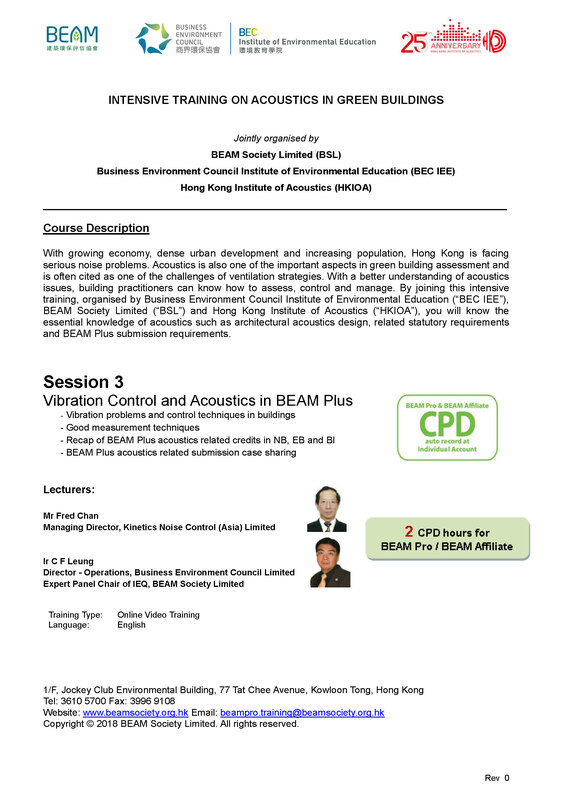 By joining this intensive training, organised by Business Environment Council Institute of Environmental Education (“BEC IEE”), BEAM Society Limited (“BSL”) and Hong Kong Institute of Acoustics (“HKIOA”), you will know the essential knowledge of acoustics such as architectural acoustics design, related statutory requirements and BEAM Plus submission requirements. 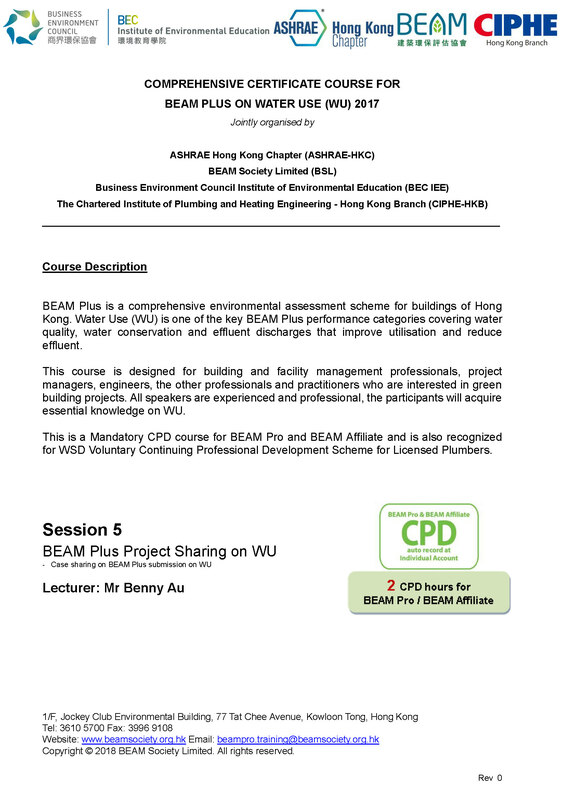 BEAM Plus is a comprehensive environmental assessment scheme for buildings of Hong Kong. Water Use (WU) is one of the key BEAM Plus performance categories covering water quality, water conservation and effluent discharges that improve utilisation and reduce effluent. 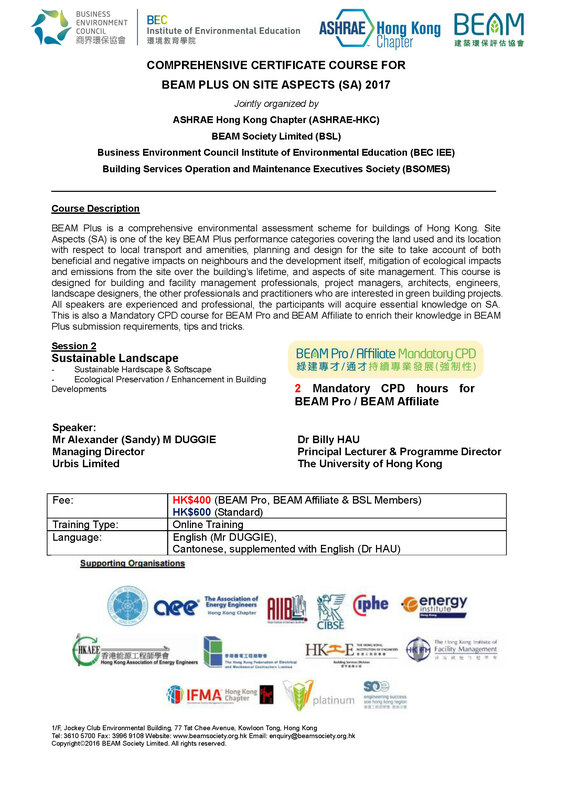 This course is designed for building and facility management professionals, project managers, engineers, the other professionals and practitioners who are interested in green building projects. All speakers are experienced and professional, the participants will acquire essential knowledge on WU. 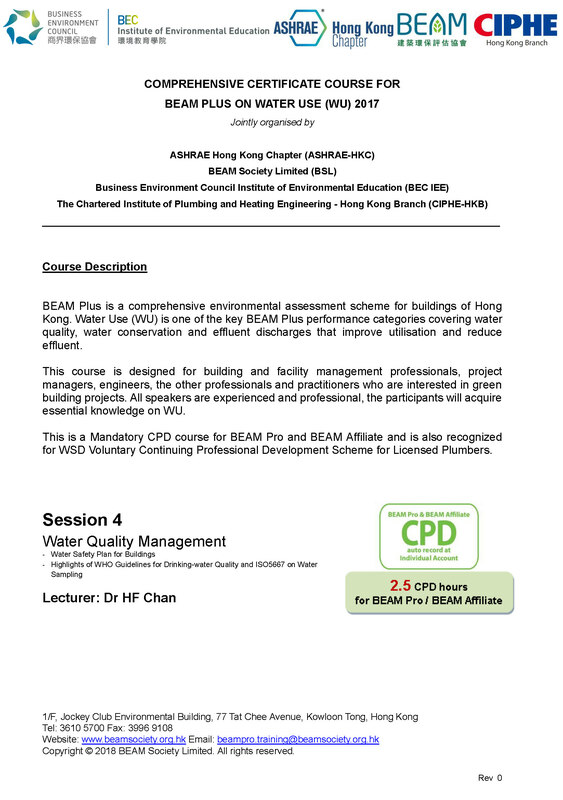 This is a Mandatory CPD course for BEAM Pro and BEAM Affiliate and is also recognized for WSD Voluntary Continuing Professional Development Scheme for Licensed Plumbers. The Montreal Protocol has scheduled the phasing out of controlled substances, including chemicals containing chlorine and bromine used as refrigerants, solvents, foam blowing agents, aerosol propellants, fire suppressants, and for other purposes. Ozone Layer Protection Ordinance (Cap. 403) 1989 gives effect to Hong Kong’s international obligations to control the manufacture, import and export of ozone depleting substances. Ozone Layer Protection (Controlled Refrigerants) Regulation 1994 requires the conservation of controlled refrigerants used in large scale installations and motor vehicles. Scheduled substances under the Ozone Layer Protection Ordinance are listed by the Environmental Protection Department. In addition to having suitable thermodynamic properties, the ideal refrigerant would be nontoxic, non-inflammable, completely stable, environmentally benign, readily available, self-lubricating, compatible with materials used in equipment, easy to handle and detect. The U.S. Environmental Protection Agency provides information on suitable substitutes for ozone depleting substances, including refrigerants for various types of air-conditioning and refrigeration equipment, fire suppression, blowing agents, solvents, etc. U.S.EPA has developed and implemented regulations for management of ozone depletion substances (ODSs) in the United States. The regulations include programs that ended the production of ODSs and require the manufacturers to label products either containing or made with chemicals that have significant ODSs. Banning the usage of CFCs in refrigerants slows the ozone depletion and global climate change. 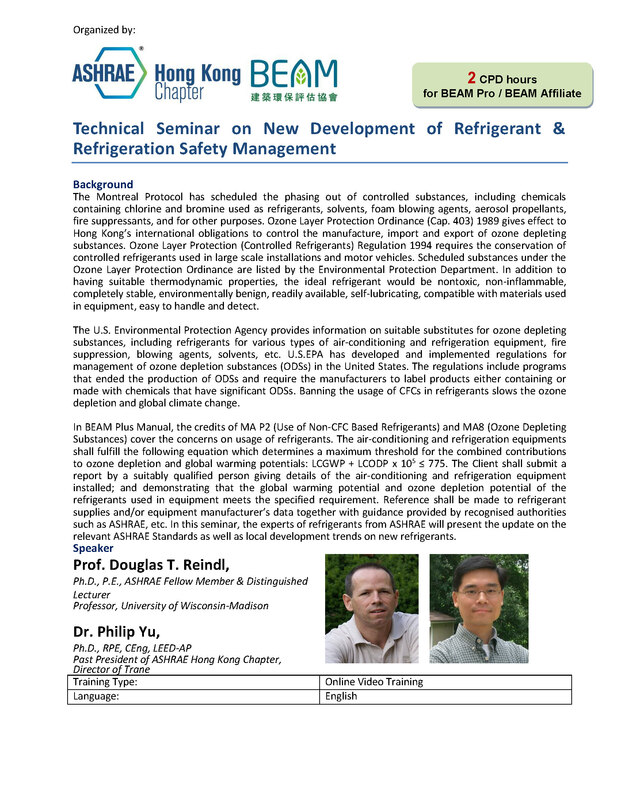 In BEAM Plus Manual, the credits of MA P2 (Use of Non-CFC Based Refrigerants) and MA8 (Ozone Depleting Substances) cover the concerns on usage of refrigerants. The air-conditioning and refrigeration equipments shall fulfill the following equation which determines a maximum threshold for the combined contributions to ozone depletion and global warming potentials: LCGWP + LCODP x 105 ≤ 775. The Client shall submit a report by a suitably qualified person giving details of the air-conditioning and refrigeration equipment installed; and demonstrating that the global warming potential and ozone depletion potential of the refrigerants used in equipment meets the specified requirement. Reference shall be made to refrigerant supplies and/or equipment manufacturer’s data together with guidance provided by recognised authorities such as ASHRAE, etc. 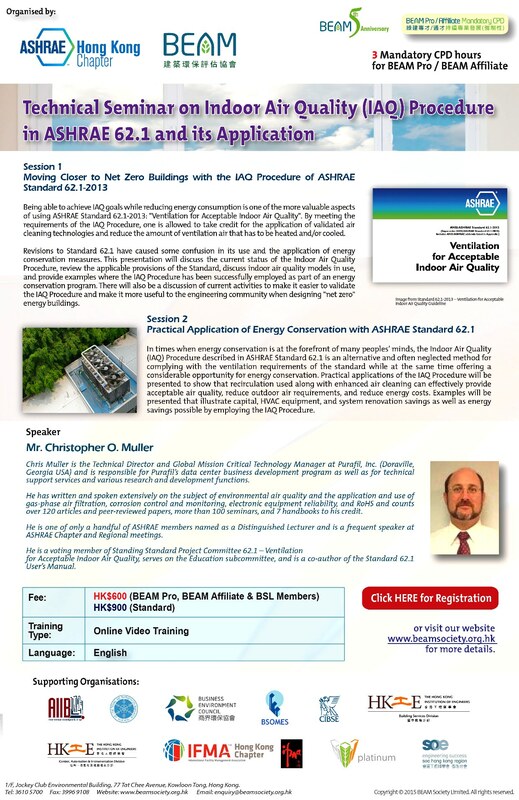 In this seminar, the experts of refrigerants from ASHRAE will present the update on the relevant ASHRAE Standards as well as local development trends on new refrigerants. BEAM Plus Interiors covers the design and construction of fit-out, renovation and refurbishment works in non-domestic occupied spaces. 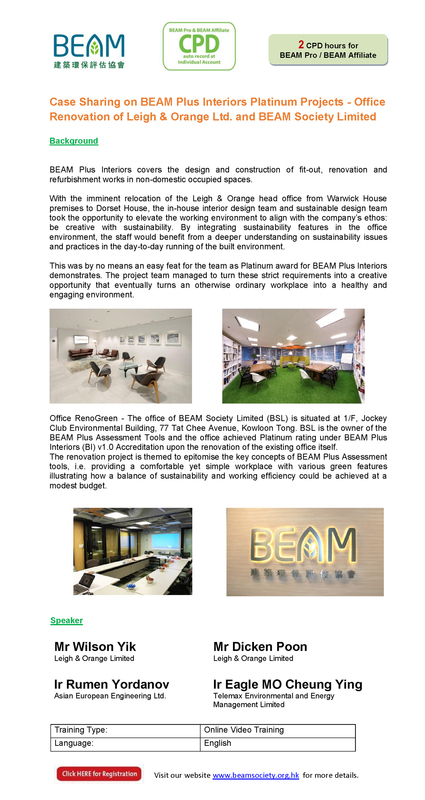 With the imminent relocation of the Leigh & Orange head office from Warwick House premises to Dorset House, the in-house interior design team and sustainable design team took the opportunity to elevate the working environment to align with the company’s ethos: be creative with sustainability. By integrating sustainability features in the office environment, the staff would benefit from a deeper understanding on sustainability issues and practices in the day-to-day running of the built environment. This was by no means an easy feat for the team as Platinum award for BEAM Plus Interiors demonstrates. The project team managed to turn these strict requirements into a creative opportunity that eventually turns an otherwise ordinary workplace into a healthy and engaging environment. Office RenoGreen - The office of BEAM Society Limited (BSL) is situated at 1/F, Jockey Club Environmental Building, 77 Tat Chee Avenue, Kowloon Tong. BSL is the owner of the BEAM Plus Assessment Tools and the office achieved Platinum rating under BEAM Plus Interiors (BI) v1.0 Accreditation upon the renovation of the existing office itself. The renovation project is themed to epitomise the key concepts of BEAM Plus Assessment tools, i.e. providing a comfortable yet simple workplace with various green features illustrating how a balance of sustainability and working efficiency could be achieved at a modest budget. The first part of the seminar will introduce the energy modeling technique and simulation tool application. The seminar will begin by highlighting the key elements to the energy simulation. 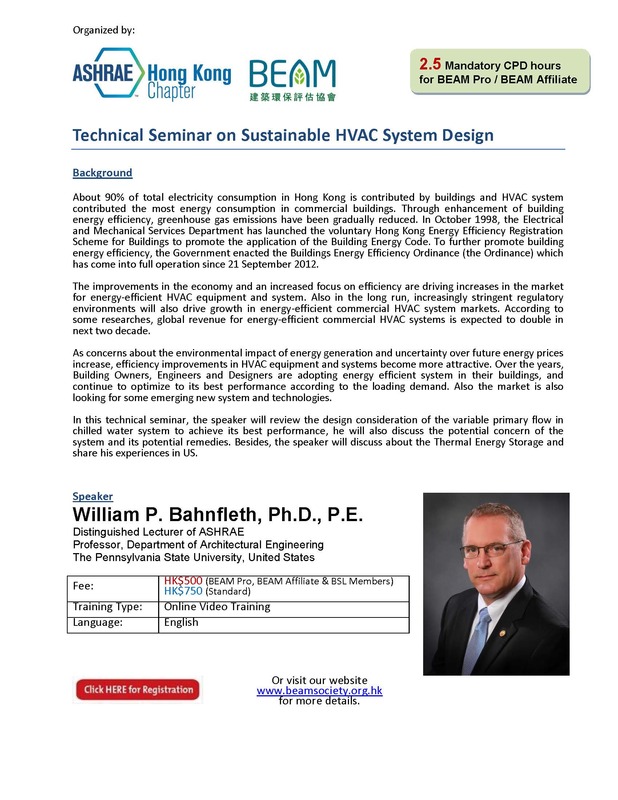 Then, the seminar will showcase the various simulation techniques in producing the energy saving features for the energy simulation. 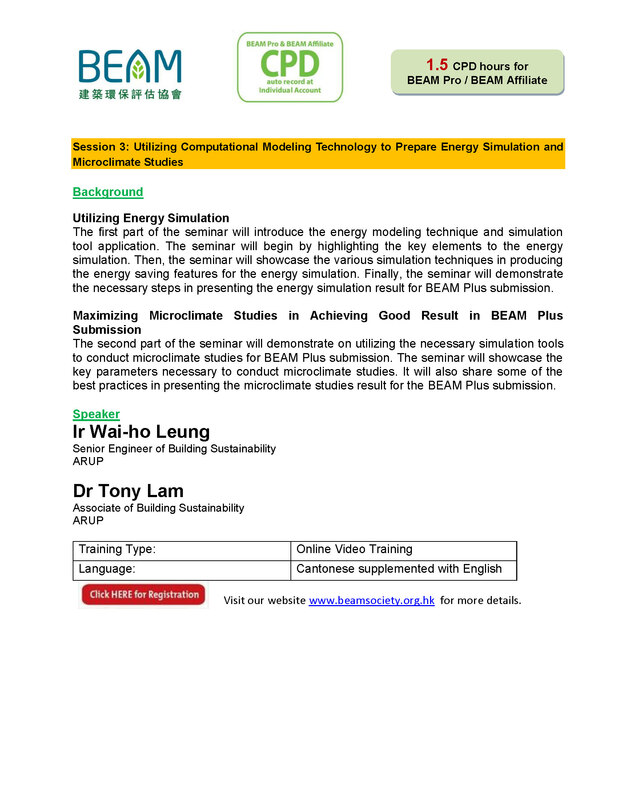 Finally, the seminar will demonstrate the necessary steps in presenting the energy simulation result for BEAM Plus submission. The second part of the seminar will demonstrate on utilizing the necessary simulation tools to conduct microclimate studies for BEAM Plus submission. The seminar will showcase the key parameters necessary to conduct microclimate studies. It will also share some of the best practices in presenting the microclimate studies result for the BEAM Plus submission. 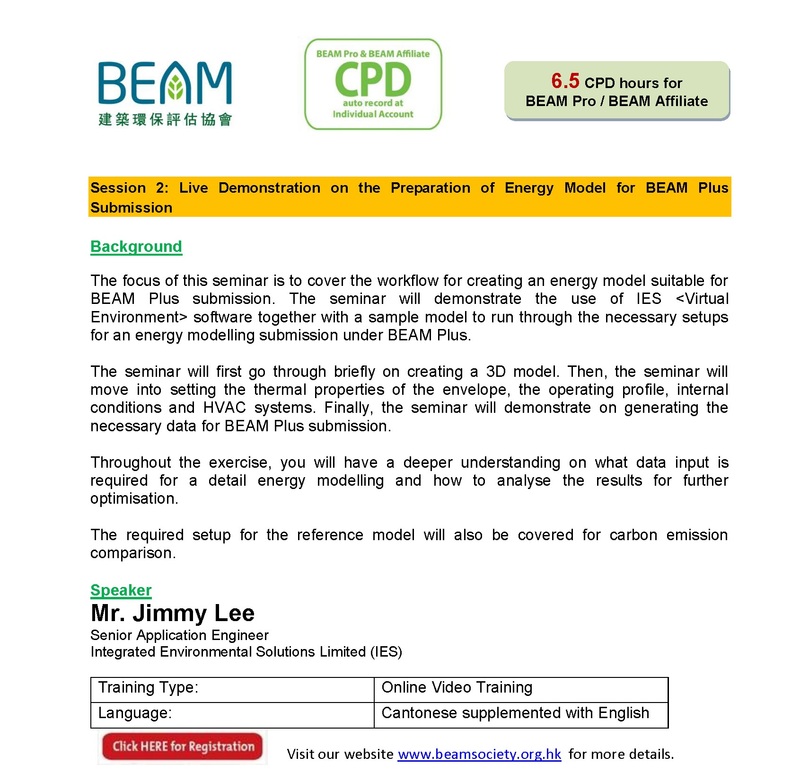 The focus of this seminar is to cover the workflow for creating an energy model suitable for BEAM Plus submission. 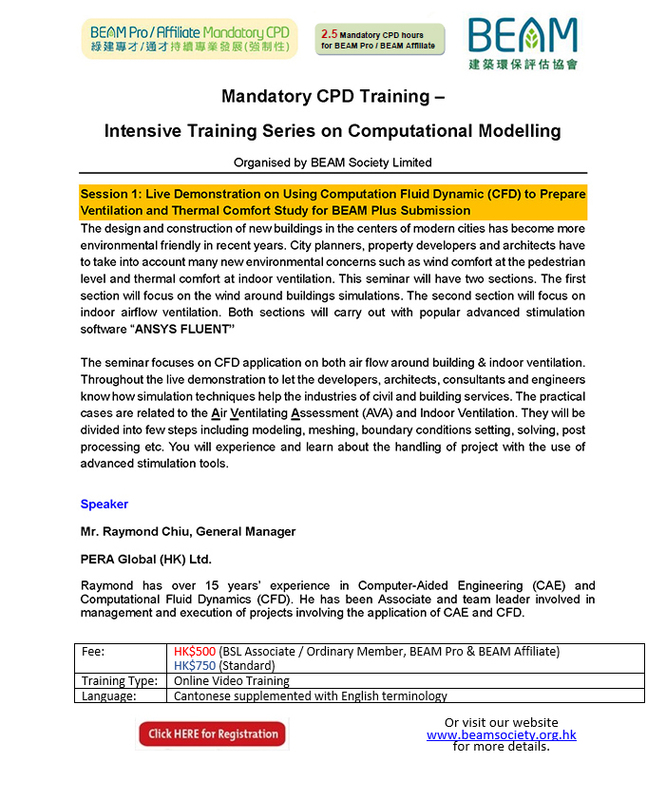 The seminar will demonstrate the use of IES <Virtual Environment> software together with a sample model to run through the necessary setups for an energy modelling submission under BEAM Plus. The seminar will first go through briefly on creating a 3D model. Then, the seminar will move into setting the thermal properties of the envelope, the operating profile, internal conditions and HVAC systems. 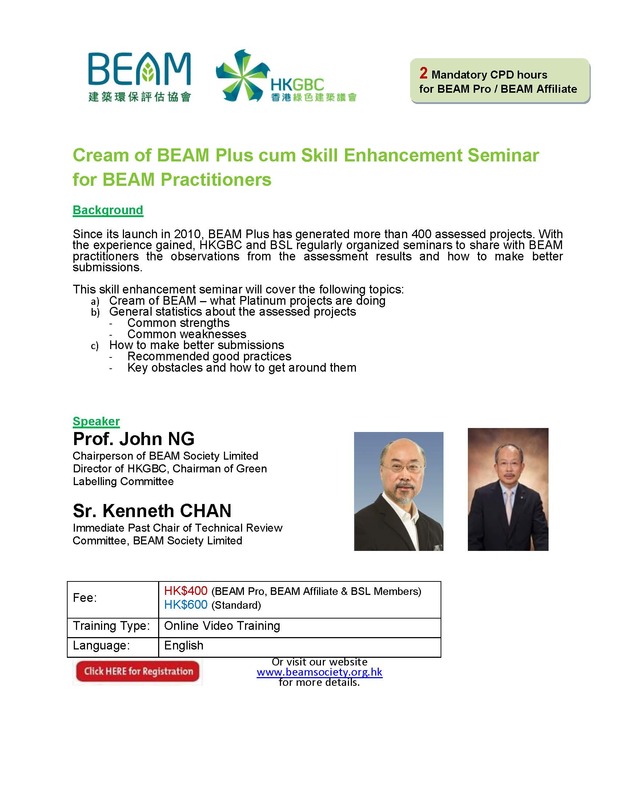 Finally, the seminar will demonstrate on generating the necessary data for BEAM Plus submission. Throughout the exercise, you will have a deeper understanding on what data input is required for a detail energy modelling and how to analyse the results for further optimisation. The required setup for the reference model will also be covered for carbon emission comparison. The seminar focuses on CFD application on both air flow around building & indoor ventilation. Throughout the live demonstration to let the developers, architects, consultants and engineers know how simulation techniques help the industries of civil and building services. The practical cases are related to the Air Ventilating Assessment (AVA) and Indoor Ventilation. They will be divided into few steps including modeling, meshing, boundary conditions setting, solving, post processing etc. You will experience and learn about the handling of project with the use of advanced stimulation tools. BEAM Plus Neighbourhood that launched in December 2016, is designed to assess project performance of a development project and help project owners to incorporate a broader framework of urban sustainability principles at the early planning stage for subsequent project implementation. In this assessment tool, outdoor environmental quality is concerned to safeguard the health, comfort or well-being of general public, as well as aspects of performance that improve quality and functionality. Good planning on building ventilation can reduce the potential increase in urban heat island effect and provide sufficient quality of outdoor air provision for indoor built environment. 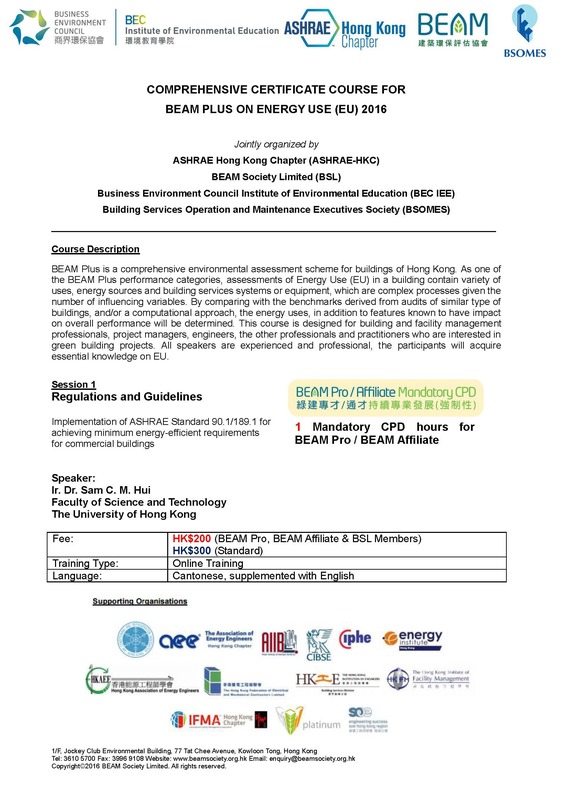 On the other hand, energy reduction and sufficient ventilation for indoor environmental quality are also concerned in other BEAM assessment tools (New Buildings, Existing Buildings & Interiors). 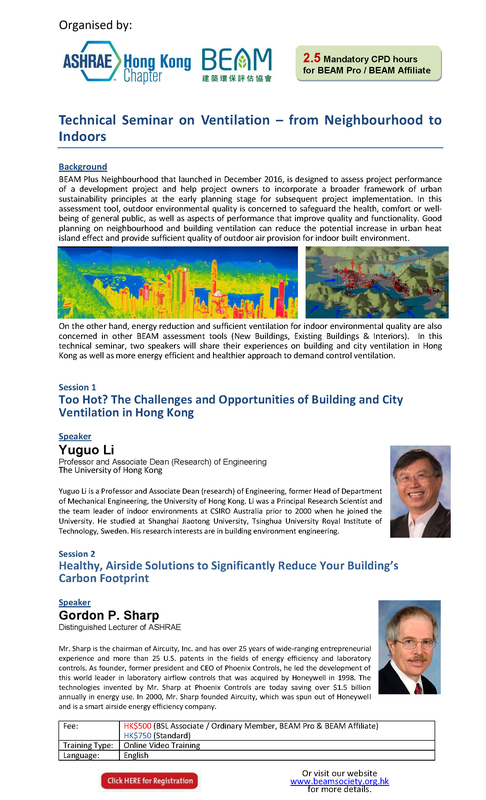 In this technical seminar, the speakers will share their experiences on building and city ventilation in Hong Kong as well as more energy efficient and healthier approach to demand control ventilation. landscape designers, the other professionals and practitioners who are interested in green building projects. All speakers are experienced and professional, the participants will acquire essential knowledge on SA. Plus submission requirements, tips and tricks. Since its launch in 2010, BEAM Plus has generated more than 400 assessed projects. 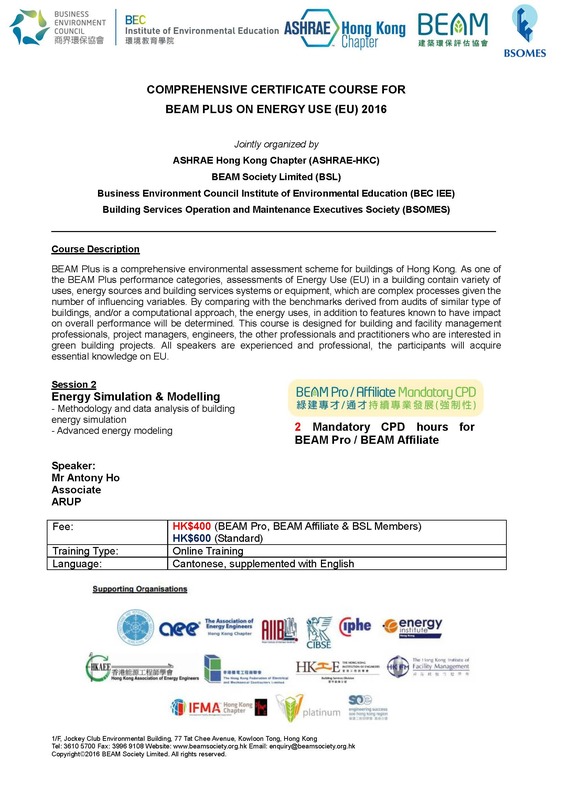 With the experience gained, HKGBC and BSL regularly organized seminars to share with BEAM practitioners the observations from the assessment results and how to make better submissions. 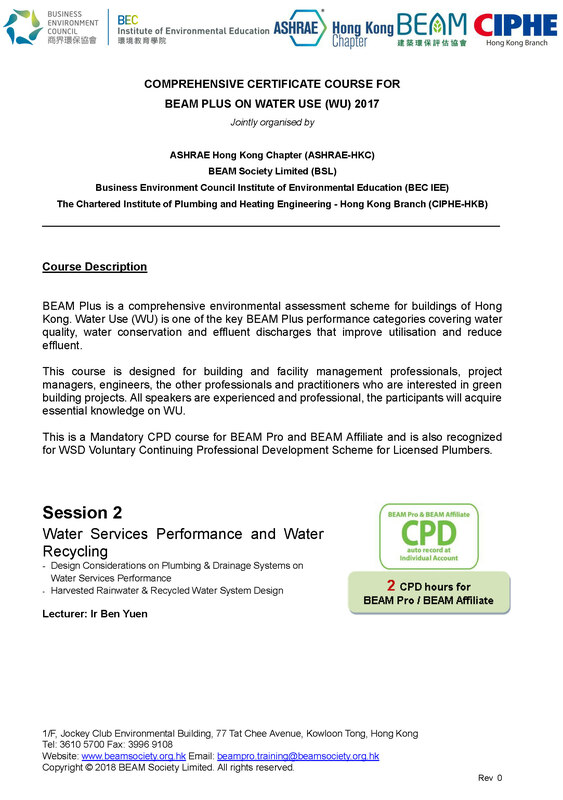 BEAM Plus is a comprehensive environmental assessment scheme for buildings of Hong Kong. As one of the BEAM Plus performance categories, assessments of Energy Use (EU) in a building contain variety of uses, energy sources and building services systems or equipment, which are complex processes given the number of influencing variables. By comparing with the benchmarks derived from audits of similar type of buildings, and/or a computational approach, the energy uses, in addition to features known to have impact on overall performance will be determined. 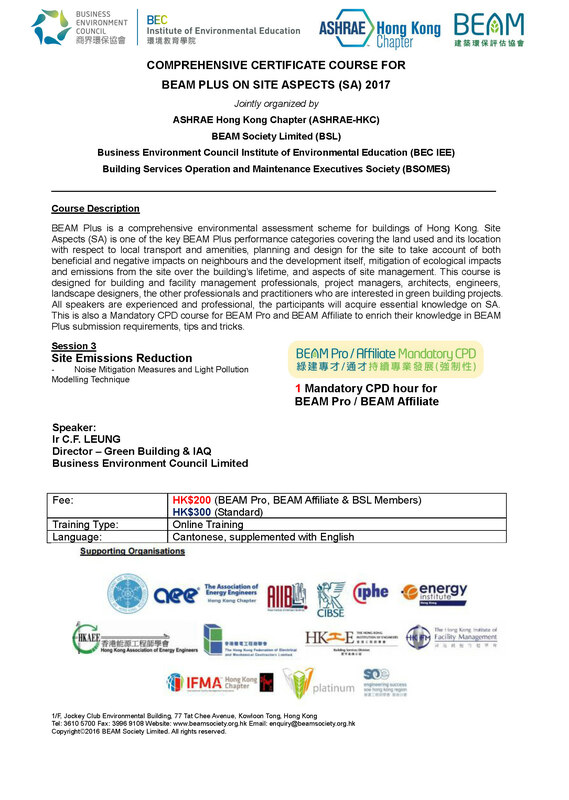 This course is designed for building and facility management professionals, project managers, engineers, the other professionals and practitioners who are interested in green building projects. All speakers are experienced and professional, the participants will acquire essential knowledge on EU. 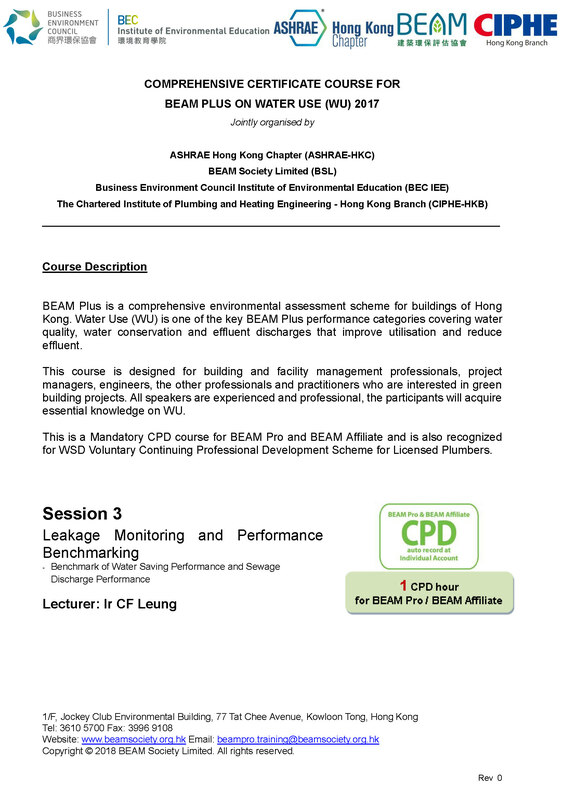 BEAM Plus is a comprehensive environmental assessment scheme for buildings of Hong Kong. As one of the BEAM Plus performance categories, assessments of Energy Use (EU) in a building contain variety of uses,energy sources and building services systems or equipment, which are complex processes given the number of influencing variables. By comparing with the benchmarks derived from audits of similar type of buildings, and/or a computational approach, the energy uses, in addition to features known to have impact on overall performance will be determined. About 90% of total electricity consumption in Hong Kong is contributed by buildings and HVAC system contributed the most energy consumption in commercial buildings. Through enhancement of building energy efficiency, greenhouse gas emissions have been gradually reduced. In October 1998, the Electrical and Mechanical Services Department has launched the voluntary Hong Kong Energy Efficiency Registration Scheme for Buildings to promote the application of the Building Energy Code. To further promote building energy efficiency, the Government enacted the Buildings Energy Efficiency Ordinance (the Ordinance) which has come into full operation since 21 September 2012. The improvements in the economy and an increased focus on efficiency are driving increases in the market for energy-efficient HVAC equipment and system. Also in the long run, increasingly stringent regulatory environments will also drive growth in energy-efficient commercial HVAC system markets. According to some researches, global revenue for energy-efficient commercial HVAC systems is expected to double in next two decade. As concerns about the environmental impact of energy generation and uncertainty over future energy prices increase, efficiency improvements in HVAC equipment and systems become more attractive. Over the years, Building Owners, Engineers and Designers are adopting energy efficient system in their buildings, and continue to optimize to its best performance according to the loading demand. Also the market is also looking for some emerging new system and technologies. In this technical seminar, the speaker will review the design consideration of the variable primary flow in chilled water system to achieve its best performance, he will also discuss the potential concern of the system and its potential remedies. Besides, the speaker will discuss about the Thermal Energy Storage and share his experiences in US. Dr William P. Bahnfleth, Ph.D., P.E. Electricity generation accounts for around 60% of the total CO2 emissions from energy use in Hong Kong, and buildings, particularly air-conditioned buildings, account for more than half of the electricity consumed each year. Compliance with the Building Energy Codes can reduce energy consumption and operating costs. The reduction of energy leads to the saving of fossil fuels, and reduces carbon dioxide emissions which contribute to global climate change. Mentioned in Energy Use aspect in BEAM Plus Manual, an energy analysis report shall include a formal certifying statement informing the scope of compliance and confirming the compliance with the BEC either by Prescriptive or Performance Option. The statement shall be accompanied by a set of documents, including as-fitted/installation drawings, design calculations and standard forms as required in the BEC. On the use of performance approach to demonstrate compliance, the statement shall include a report describing the simulation software, the simulation results, and the modeling assumptions. Therefore, a simulation software tool is important to model the energy performance for all aspects of our buildings today. 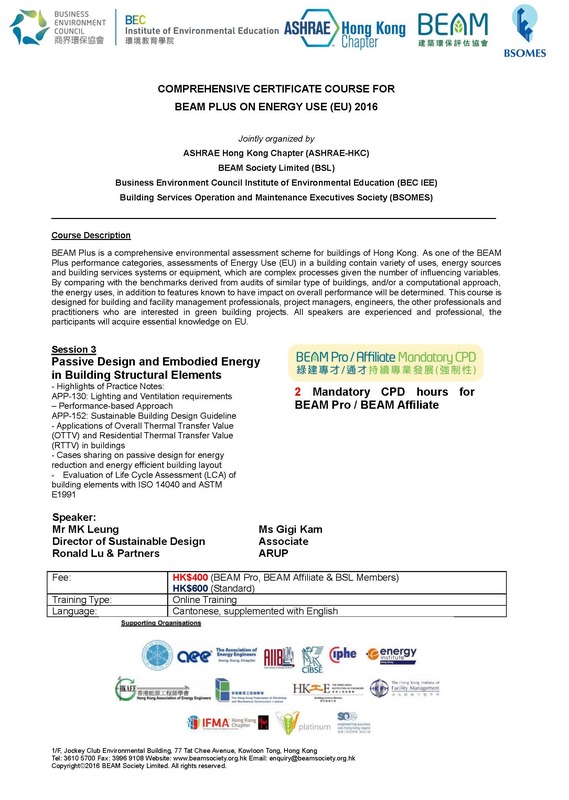 In this technical seminar, the speaker will review the building energy simulation on its development and trends. 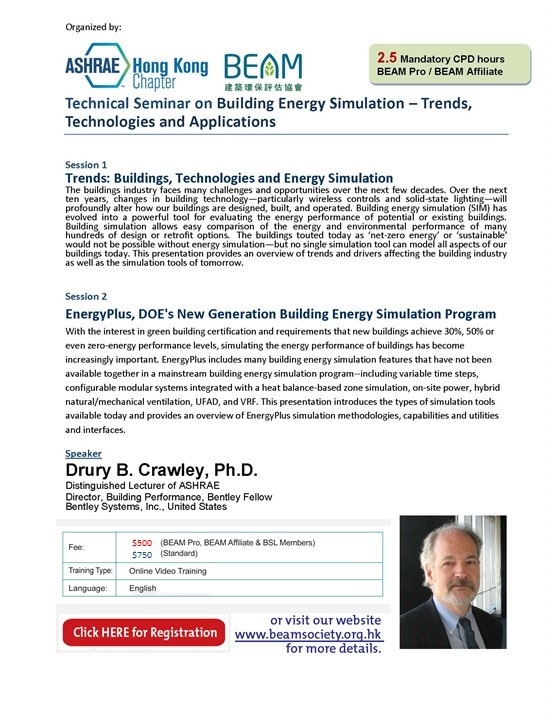 Also, he will introduce the types of building energy simulation tools available today and provide an overview of EnergyPlus simulation methodologies, capabilities and utilities and interfaces. Indoor environment conditions have a significant impact on the quality of life given that on average people in Hong Kong spend around 85% of their time indoors. Poor indoor environments in commercial and institutional buildings can impact on productivity and may pose health risks to users. The indoor environment criteria used for the design, such as ISO, CEN, ASHRAE 55, etc., is generally defined by the client and/or consultant appropriate to the type and use of the premises included in the development, and is a basic performance specification. On the other hand, electricity generation accounts for around 60% of the total CO2 emissions from energy use in Hong Kong, and buildings, particularly air-conditioned buildings, account for more than half of the electricity consumed each year. Ensuring buildings are designed for good energy performance is also the key to the conservation of resources and reductions in environmental loadings. Therefore, the design, operation and maintenance of buildings should seek to provide a good quality indoor environment, but with optimum use of energy and other resources. 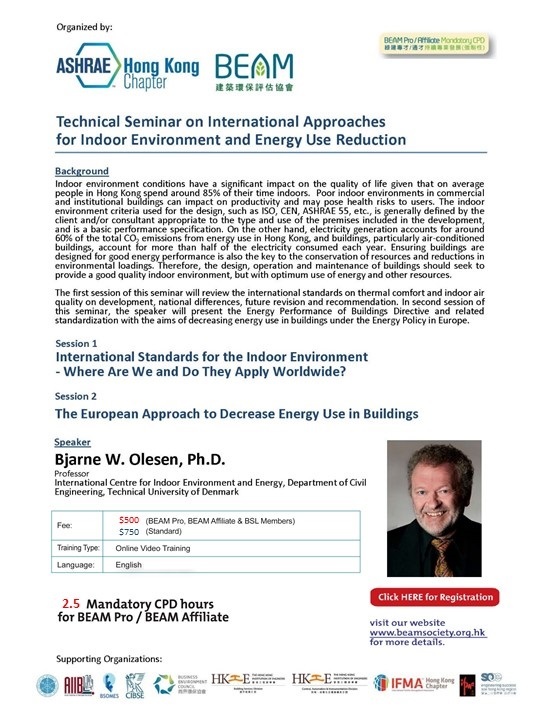 The first session of this seminar will review the international standards on thermal comfort and indoor air quality on development, national differences, future revision and recommendation. In second session of this seminar, the speaker will present the Energy Performance of Buildings Directive and related standardization with the aims of decreasing energy use in buildings under the Energy Policy in Europe. Conservation International Hong Kong (CI-Hong Kong), the newest international environmental NGO in the city, aims to accelerate Hong Kong's leadership in urban and corporate sustainability. 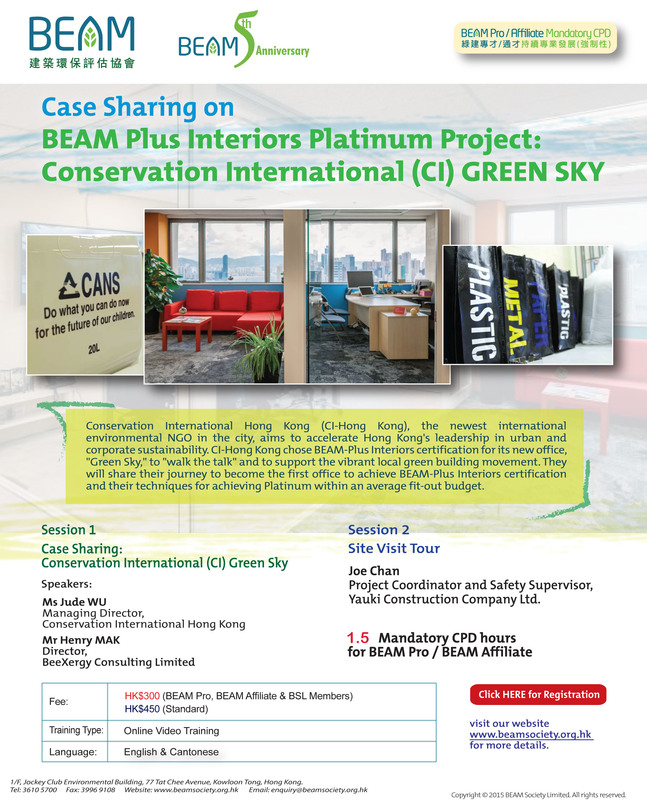 CI-Hong Kong chose BEAM-Plus Interiors certification for its new office, "Green Sky," to "walk the talk" and to support the vibrant local green building movement. 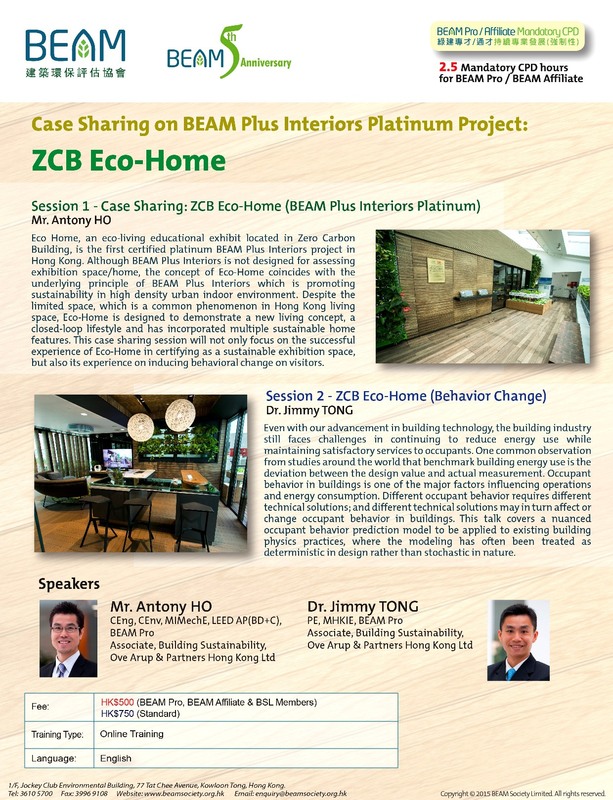 They will share their journey to become the first office to achieve BEAM-Plus Interiors certification and their techniques for achieving Platinum within an average fit-out budget. Project Coordinator and Safety Supervisor, Yauki Construction Company Ltd.
Accomplishing sustainable urban development is a crucial challenge for cities in the twenty-first century. The green building assessment tools play a critical role in promoting green and sustainable practices. The assessment tools introduce mandatory prerequisites which in alignment with current industry trends, standards, and regulations. This conference aims to provide an opportunity for building professionals to explore global solutions for sustainable urban development, and to provide suggestions in response to the government’s Energy Efficiency Labelling Scheme for buildings. Housing Authority endeavors to provide safe, affordable and sustainable housing in Hong Kong. To achieve this goal, HA focus on passive design and adopts practicable and financially-viable environmental provisions to comply with promulgated guidelines including BEAM Plus on environmentally friendly designs. 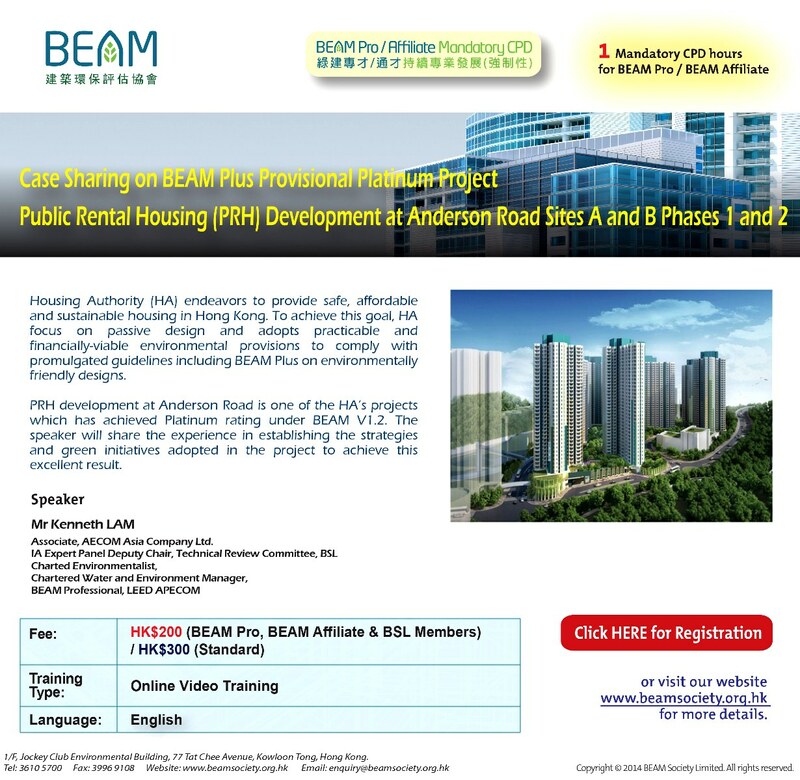 PRH development at Anderson Road is one of the HA’s projects which has achieved Platinum rating under BEAM V1.2. The speaker will share his experience in establishing the strategies and green initiatives adopted in the project to achieve this excellent result. Since its launch in 2010, BEAM Plus has generated more than 100 assessed projects. With the experience gained, it is an appropriate time to consolidate the lessons learned and to share with BEAM Pro/BEAM Affiliates the observations from the assessment results and the common do’s and don’ts in BEAM Plus submission. Drainage Services Department (DSD) has been pursuing sustainable development and improvement to the environment. In the past decade, DSD paid a lot of efforts in carrying out greening works to the drainage and sewerage facilities. 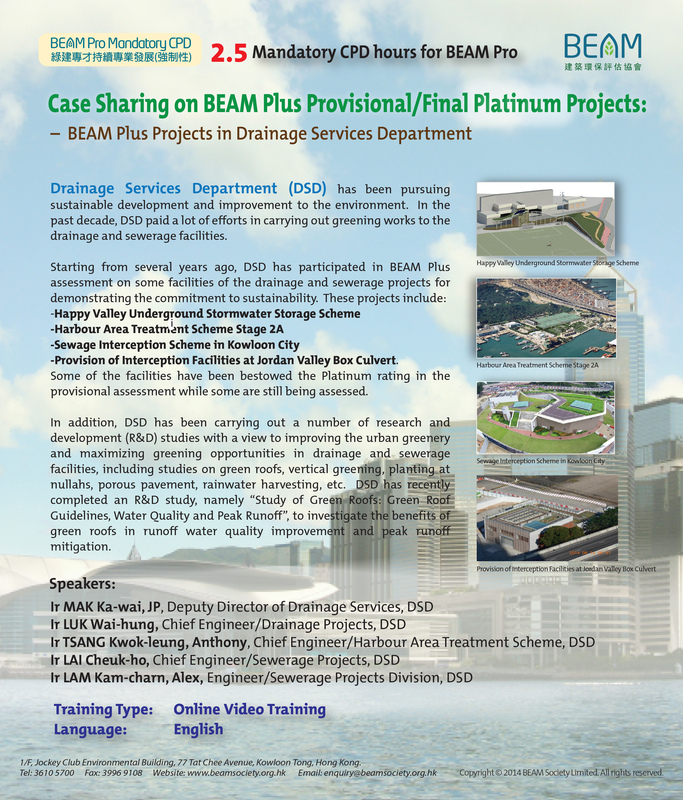 Starting from several years ago, DSD has participated in BEAM Plus assessment on some facilities of the drainage and sewerage projects for demonstrating the commitment to sustainability. Some of the facilities have been bestowed the Platinum rating in the provisional assessment while some are still being assessed. 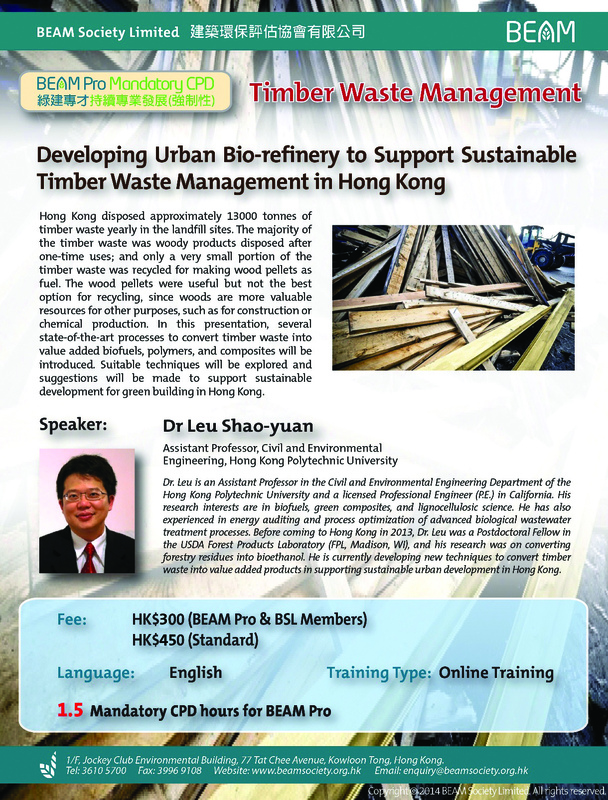 In this presentation, several state-of-the-art processes to convert timber waste into value added biofuels, polymers, and composites will be introduced. 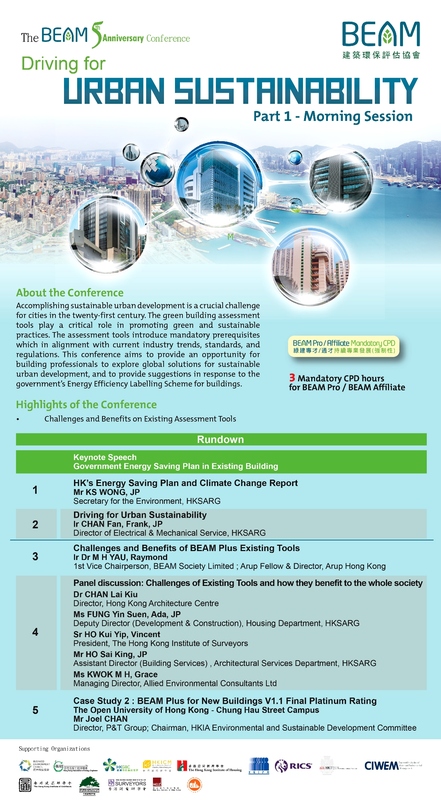 Suitable techniques will be explored and suggestions will be made to support sustainable development for green building in Hong Kong. * The CPD trainings are updated periodically without further notice. Terms and Conditions Copyright © 2013-2019 BEAM Online Training Portal, Inc. All Rights Reserved.